Ridgefield Park, NJ (May 22, 2012) – Samsung Techwin America unveiled version 2.0 of its iPOLiS Mobile app for remote access viewing of Samsung's iPOLiS network video cameras and digital video recorders (DVRs). Version 2.0 is optimized for Android and iPhone smartphones and offers enhanced live and playback options. New users may download the app for free from iTunes or the Android market while existing users need only register the app again as new. 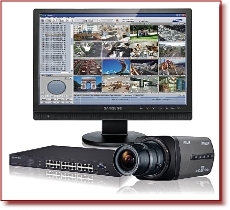 Upgraded features of iPOLiS v2.0 allow users to remotely control the pan, tilt and zoom functions of the latest Samsung network cameras via an easy-to-use interface that is also compatible with the Samsung SRD series DVRs. The app is designed for on-the-go security professionals and set up can be completed in less than a minute to enable viewing of streamed video from selected cameras via a wireless or 3G network.